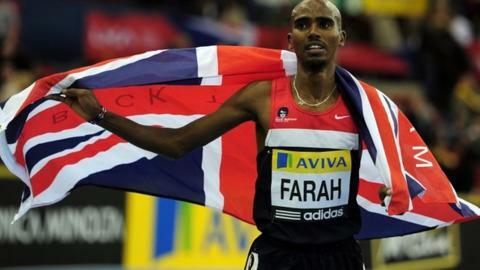 Mo Farah has been named in a 39-strong Great Britain squad for next month's World Indoor Championships in Istanbul. The world 5,000m champion was a doubt to take part in the 3,000m in Turkey, having lost over two miles on Saturday. "It's quite normal that athletes get beaten," said Great Britain head coach Charles van Commenee. "If athletes remain unbeaten for a number of years, the moment they get beaten is coming closer every day so that's out of the way now." He added: "I've got no concerns whatsoever. "It's quite healthy as well five months before the Games so there's no reason to be concerned. "There's this assumption that Mo is unbeatable but that assumption is only in Britain. I don't think in Kenya or Ethiopia people will take the same view." World champion Jessica Ennis will look to retain her title in the pentathlon in Istanbul, while Dwain Chambers goes in the 60m. "This is a strong team, one that can realistically challenge for medals and make finals," added Van Commenee. Britain have had a strong start to the 2012 indoor season, with 19 personal bests and three British records broken. "Ennis has been in stunning form this season including a win in Birmingham last weekend against some of the best sprint hurdlers in the world. Her rematch against Tatyana Chernova will be one of the highlights. The Russian beat Ennis to take gold at the world outdoor championships last year. Mo Farah was beaten in Birmingham and afterwards expressed doubts about going to Istanbul but he's named at this stage in the 3,000m. In the women's 60m, the selectors have opted for youth over experience as Jodie Williams and Asha Philip get the places." Ennis ran the fastest 60m hurdles in the world this year at the Aviva Grand Prix in Birmingham last weekend, while last month Holly Bleasdale, who will compete in the pole vault in Turkey, smashed her own British indoor record, moving to second on the all-time world list with a clearance of 4.87m in Lyon. "There are some good athletes coming through," added Van Commenee. "I am looking forward to seeing how they perform on the senior international stage. "I am happy with where we are now. Three years ago [when I took over] I could only have dreamt that we would be in this position. "That is regardless of the result in Istanbul. I have seen enough good work and progress during this indoor season so it's all looking good." British indoor 60m hurdles champion Andy Pozzi is one of five new faces in the squad, while Perri Shakes-Drayton, a 400m hurdles specialist, is named in the women's 4x400m relay squad alongside 400m Olympic champion Christine Ohuruogu.